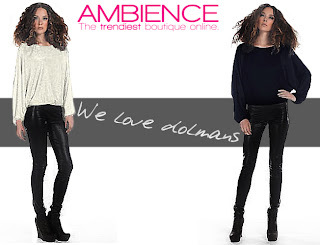 At Ambience we love the dolman sleeve, large arm opening and tapered to a tight cuff, we like to push the neckline off one shoulder if the style permits. The tops are comfy and are flattering to most shapes. Grace has a customer yesterday that she worked with that wanted to camouflage a few mid-section issues and she styled her in these tops. Remember proportion is important; there are many styles and lengths so it is easy to find the one that is right for you. Check out the new arrivals from Lola & Sophie both have dolman sleeves and look amazing on.